Discussion in 'Music Corner' started by cut to the chase, Jul 15, 2018. 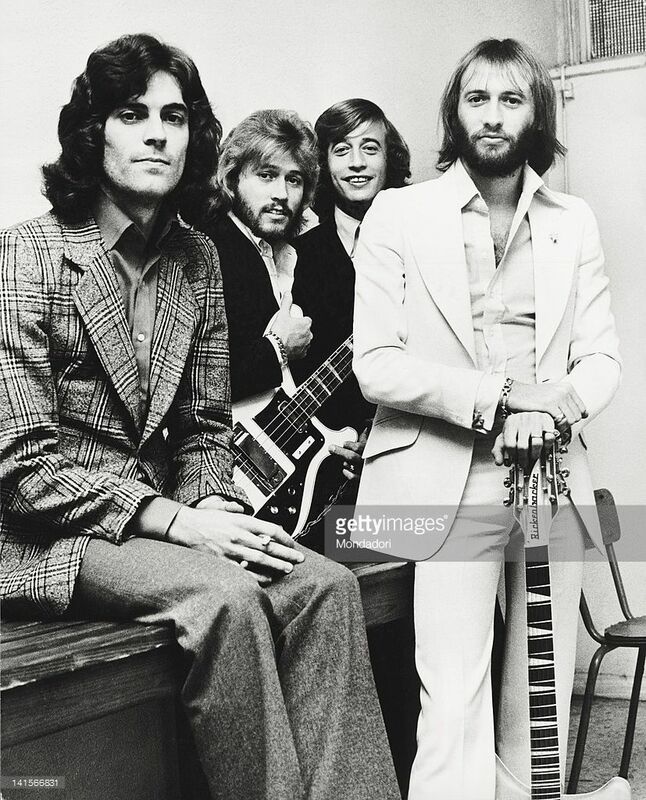 "My World" is a 1972 single released by the Bee Gees. 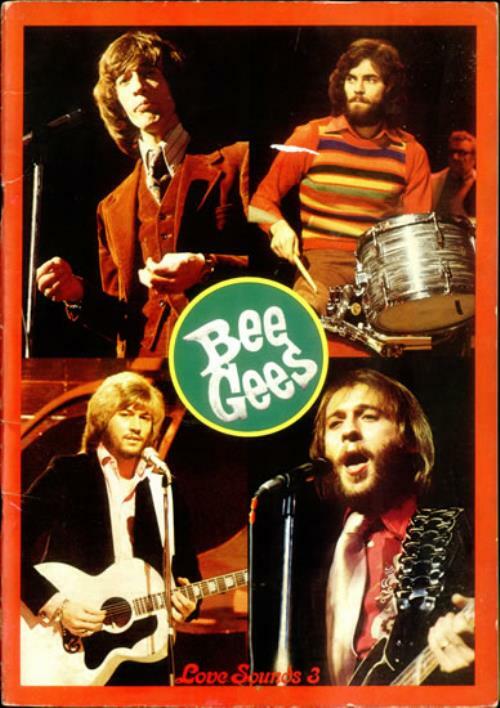 It was originally released as a non-album single on 14 January 1972 worldwide, but it was later included on the LP Best of Bee Gees, Volume 2 in 1973. The flip of the single entitled "On Time" is a rock number that was a Maurice Gibb composition. "My World" reached the Top 20 in both US and UK. "My World" was written in the backstage of ITV's The Golden Shot with some same musical ideas as "How Can You Mend a Broken Heart". Maurice said "Whether something is a soft ballad or an uptempo thing, we would record it if we thought it was going to make a good single". By October 13, the band recorded "My World" along with unreleased tracks, "What Could Have Been Done" and "Goodbye Blue Sky". The song has four verses as they repeated the chorus numerous times. This track kicks off with an unusually casual instrumental intro like their other unreleased track, "God's Good Grace". Barry Gibb explains "My World": "it's not from the album, followed along some of the same musical ideas as 'How Can You Mend a Broken Heart'". As Robin Gibb states in the liner notes of Tales from the Brothers Gibb, "One rollicking little jaunt that me and the lads came up with in downtown Birmingham, England, whilst doing a television show called Golden Shot, the ensuing results being that it went on to be a huge top 20 hit in the UK and the US that left the three of us 'drooling' with pleasure." The song has a fantastic play of words in the refrain part: "My world is our world, and this world is your world, and your world is my world, and my world is your world is mine". It was the last single released by the band with Geoff Bridgford as well as the single cover as he left in March that year. 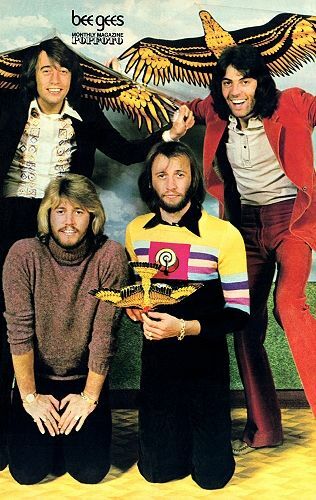 In the music video was the group in a recording studio, Barry Gibb was shown without his trademark beard, like he does on the group's later videos such as "Night Fever", the alternate music videos of "How Deep Is Your Love" and "Stayin' Alive" as well as the video of his 1984 solo single "Fine Line". "My World" also reached #15 in Cash Box in two weeks. I LOVE My World. One of my favorite Bee Gees songs. The play on words combined with the melody is very catchy. Kind of put me in mind of Lonely Days in terms of the repeated verses and chorus (the only change being who was singing lead). I was surprised it was a non-album track when I was first going through this period of their catalog. It could have worked well on To Whom It Concern, imo. Too bad they never seemed to include in it their live sets or most of their greatest hits albums. Great Maurice track. Very catchy. Always love Maurice's vocals. Barry's son, Steve, has performed it during Barry's tours. He also covered it as his track on the Gibb Collective tribute album. cut to the chase likes this. I love 'My World' as well, the play on words combined with the melody is very catchy indeed. I also love the verses sung by Robin. Absolutely magnificent song. One of the best ever written. Another one of their perfect pre Main Course Bee Gees sounding recordings. The alternate leads,Robins impassioned vocals against Barrys breathy bring it back down ones then Barry going back to full power chorus. First I have heard On Time so initial impression was that it was a filler B side. Before anyone screams at me I get more then a few of their songs need to grow on a person. pablo fanques, cut to the chase, Castle in the air and 1 other person like this. A-C-B-C-A-C-B-C ("C" represents the chorus). The only place I ever hear, or ever HEARD, "My World" on the radio is on miracle oldies station KXFM out of Lancaster California, where it's in sorta heavy rotation---I think I hear it more than any other Bee Gees song there. ALways loved "On Time" and went nuts when Barry pulled it out (as above with his son singing) on his last tour. Let me say "most recent" in the dream-hope it won't end up his last. "My World". A single with a Robin lead vocal - great! Actually the song is good but not great, a bit too repetitive plus I really dislike that key change which smacks of "OK, so how do we finish this song?" I always regarded My World as something of a return to form after the previous two (undeniably big hits), which I was lukewarm to. My feelings are pretty much the same as always. I'd rather listen to Please Read Me or And the Sun Will Shine or Kilburn Towers or Melody Fair or If I Only Had My Mind on Something Else, but My World is still pretty decent. No memory of this one at all. Which is surprising, because oldies radio in Arizona played more vintage Bee Gees tracks like "Massachusetts" pretty frequently, even though they weren't huge US hits and arguably more dated. Agree with your assessment of the song. I can see why oldies radio didn't revisit this one often. It sounds much older than "How Do You Mend..." for whatever reason, much more '60s. I never heard "My World" on the radio in 1972. I wasn't as attentive during much of 1972 as I had been in the summer of '71, so that doesn't completely surprise me. But it turns out that WFIL in Philadelphia never added the song; I've got a nearly complete set of their charts, either in original paper form or from data I found on the Internet, from 1970 to August 1976, and it never made the WFIL top 30. This probably explains why the first time I even heard of the song was in early 1978, when I bought a book called Rock Almanac. This book had listings of every Top 20 single in Billboard and in one of the UK magazines (can't remember which one) from 1955 to 1973, and it listed them together, so you could see at a glance which songs were hits in the States but not in the UK and vice versa. It was the first inexpensive book to have Billboard chart data in it, and I started to use it as a collecting guide almost immediately. My goal was to get every Billboard Top 20 single listed in the book, and then to continue that collection right up to whatever the present day was. It took until the early 1990s, but I completed it. I still have 'em all, from the start of 1955 to the end of 1989 (using the Best Sellers chart from January to November 1955, the Top 100 from November 1955 to July 1958, and the Hot 100 thereafter), with as many as I could locate on 45 from the 1990s. Believe it or not, one of the very last 45s I found to complete my collection was "My World." By the time my Top 20 want list got under 200, I started to use Goldmine ads and record shows to try to fill in the gaps. If memory serves, I finally found "My World" around 1992, at a collector's shop that had a lot of old store stock. In the interim, I became more aware of "My World" from hearing it on Tales from the Brothers Gibb. Like "Don't Wanna Live Inside Myself," it would have been a better song if it was shorter; literally the entire song repeats itself, like another song from the same era that could have used a judicious edit, "Tiny Dancer" by Elton John. As a result, it's only OK to me. "On Time" may sound less like the Bee Gees than any other song they did before they re-invented themselves in the mid-1970s. In the era before Shazam and other song-identifying apps, I thought playing "On Time" would make a great "who is the artist of the following song?" trivia question. Billboard predicted in its January 15, 1972 issue that "My World" would be a Top 20 single, writing in its spotlighted review, "The Gibbs have penned a poignant driving rock ballad that offers the potent sales appeal of another 'How Can You Mend a Broken Heart.'" Cash Box was just as favorable, as it listed "My World" first in its Singles Picks of the Week for January 15: "There's a world of contagious ballad power in the brand new track from the Brothers Gibb. Should rank with 'How Can You Mend A Broken Heart' in sales clout." Record World didn't review it until January 22, 1972, but it was one of the four Singles of the Week on Page 1: "Barely missing their last time out, group should achieve similar success as 'How Can You Mend a Broken Heart.' Co-authored by Barry & Robin Gibb, and the two share lead vocals. Builds over so carefully with haunting refrain. Mr. Stigwood adds producing talents." With three similar reviews, perhaps it's appropriate that "My World" would have almost identical peak positions in all three magazines. In both Cash Box and Record World, it peaked at #15, and in Billboard, it stalled at #16. The song was a Top 10 hit in numerous places, large, medium, and small, including Chicago and Boston. But it was not a big hit in New York City, and as mentioned, Philadelphia didn't chart it at all; the lack of action in those two big markets probably kept "My World" from making the national Top 10. On the Record World M.O R. Chart, "My World" peaked at #16, and on the Billboard Easy Listening chart, it got to #19. 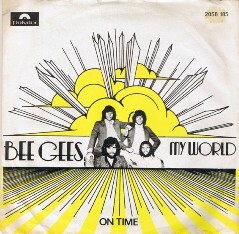 "My World" would be the Bee Gees' last non-LP A-side in the U.S., not including single edits. "On Time" was far from the last non-LP B-side. Atco 45-6871 was released on or around Monday, January 3, 1972, the first business day of the new year, based on the review dates in the trade papers. It could have been a bit later in the week, as it apparently missed the Record World deadline for January 15 and appeared in the January 22 issue instead. Again, the stock 45s were fold-down mono. "My World" (matrix number 71C-23567) would make its first stereo appearance other than on a promo as part of the 1973 LP Best of Bee Gees, Vol. 2; "On Time" (matrix 71C-23566) would have to wait until the Tales of the Brothers Gibb box set. As with the "Lonely Days" 45, the matrix numbers were assigned in the order they appear on the tape Atco got from Polydor UK, and not because there was any plan for "On Time" to be the A-side, although that would have been very interesting. In keeping with recent history, Atco used four pressing plants for "My World" -- Specialty (SP), Plastic Products (PL), Monarch (MO), and Shelly (LY). This time, it appears as if the only plant with more than one version is LY. -- All copies have the artist as "The Bee Gees"
-- the perimeter print on the SP and PL is the usual "MFG. BY ATLANTIC RECORDING CORP., 1841 BROADWAY, NEW YORK, N.Y." Again on the MO copies, it is the 1960s-style "Division of ATLANTIC RECORDS, New York, N.Y."
Here is where the two different LY pressings come in. Some copies have the same perimeter print as past Shelly Bee Gees 45s: "MFG. BY ATLANTIC RECORDING CORP., 1841 BROADWAY, NEW YORK, N.Y. 10023". But other copies have a slightly different version (emphasis mine): "DIST. BY ATLANTIC RECORDING CORP., 1841 BROADWAY, N.Y., N.Y. 10023". An interesting error pressing is known to exist from Shelly. On some copies, the "On Time" label is missing most of its black overlay (the trumpet logo, the words "RECORDS" and "45 R.P.M. ", the black outline of the white letters of "ATCO", and the perimeter print). This was obviously accidental, thus doesn't really count as an official variation, but it's interesting to see. Promo copies are mono/stereo with "My World" on both sides with a time of 4:20. They are known to exist from Specialty, Plastic Products, and Monarch. On the stereo side, the SP copies have a whitish gray label rather than light blue; the PL copies are light blue; and the MO copies are a darker light blue than on PL. The perimeter print on the SP promos is different than on the SP stock copies. The promos state: "DIST. BY ATLANTIC RECORDING CORPORATION, 1841 B'WAY, N.Y., N.Y. 10023". The MO perimeter print also is different from MO stocks: "MFG. BY ATLANTIC RECORDING CORP., 1841 BROADWAY, NEW YORK, N.Y." PL promos add the words "PLUG SIDE" to the labels; MO promos add "PLUG SIDE", "PROMOTION COPY" and "NOT FOR SALE" to the labels. An oddball advance one-sided mono promo was pressed by Monarch. It has no composers for "My World," the artist is listed as only "Bee Gees" (no "The"), and the publisher is listed as only BMI. Allegedly, a later promo with long (4:20) and short versions of "My World" exists, but this has only been mentioned by a poster on 45cat, with no photographic evidence. (It's also not on Discogs nor for sale on eBay.) Until I see images, I am skeptical. Hep Alien, Juggsnelson and cut to the chase like this. I first heard "My World" on the Gold Vol 1 comp and it certainly fit right in with the earlier material from the late 60s. The only time I ever heard "My World" on the radio was during a recent broadcast of Casey Kasem's 70's countdown on my local station. It's definitely one of their lesser known hits. I think the repetitive chorus kind of hurts the song though the verses have nice lyrics. I don't remember hearing this on New York radio at the time but I can't imagine that all of the stations avoided this single entirely. I certainly had no trouble finding it in the record stores back then. Yes, it is a bit repetitive but beautifully performed and it's one that I enjoy more now than some of the other overplayed hits. I love "My World." The chorus makes you want to sing along...at the top of your voice! I wish that they could have played it live more. The single has been played often on South African radio. cut to the chase and Hadean75 like this. I do when it comes up on my car's shuffle. It's an irresistible melody sometimes lol. The next single mentioned on the Bee Gees' Wikipedia Discography was only released in the Netherlands and Belgium in May 1972. 'Israel' was taken from the album 'Trafalgar' and peaked at number 22 in the Netherlands. 'Dearest' was chosen as the B-side. Who's the guy with the beard? "Israel" is a great song, though the lyrics don't make a lot of sense - not that that's unusual for the Bee Gees. "Dearest" is miles over the top, Robin really laying on the pathos with a trowel. granata, cut to the chase and mark winstanley like this. pablo fanques and cut to the chase like this. Not really a fan of either song. They're not bad, just not too memorable. They just don't do anything for me. Geoff Bridgford was with the band from around 1970 to 1972ish (as touring drummer, and the drummer on 2 Years On and Trafalgar albums, and couple of songs off of To Whom It May Concern). I believe he was from the band Tin Tin, whom Maurice produced. Hep Alien and cut to the chase like this. Clearly he was hired for his beard as much as his drumming abilities. Colin didn't look like a Gibb!